Hamilton Tree has a variety of methods for providing quality tree pruning services. 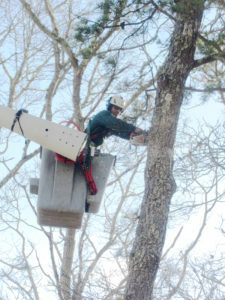 Whether a tree climbing professional is needed for that backyard tree or a bucket truck needed for that tricky limb over the garage, Hamilton Tree has the professional knowledge to handle your job safely and efficiently. Trees are pruned for safety, health and aesthetic reasons. Pruning for safety may involve removing branches that could cause injury or property damage. Removing wood that could be diseased or infested by insects improves the trees health. Aesthetic pruning can also be done to enhance the natural form of the tree. And let’s not forget those Cape Cod views! Oftentimes trees can diminish those views of the water, but a little vista pruning by our crews will help revive that for you. 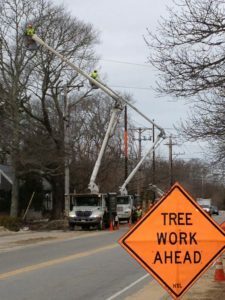 To avoid serious injury to yourself or major damage to your property, large trees with larger limbs should be left to our experienced professionals. Call today to schedule a consultation with one of our Certified Arborists to address all of your property’s pruning needs. I just want to let you know that the guys today did an AWESOME job. I was so excited to see that big pile of brush gone when I pulled up this morning. I watched them take the tree down and was amazed and impressed. I can tell they are very well-trained. And being retired Navy I was impressed again of how organized and safe they were in the removal of the tree, as well as the clean up. Thank you so much again.